We just received the new collection, Days of Yore (we love the bright colors). We contacted Sue to see how she came up with such great colors. Thats the easy part! I go with my favorite colors. I lovebrights. I chose the color for Thor based on the story I wrote. He wound up being blue cause it’s easy to rhyme ;). I choose a few main colors (purple, hot pink, lime green, turquoise.) I am limited to the number of colors I can use because of the screen printing process, so the rest of the 10 colors are chosen to go compliment the main colors. We have included a little more info about Sue that we thought you might be interested in. If you have any favorite childhood memories? We were big campers when I was a kid. I still love to camp, only now I do it in a cabin with a microwave and hot shower! When did you start quilting? I finished my first quilt about the same time I graduated high school, but my addiction came when I bought my first Quilt In A Day book. I was seriously hooked. “A” pet??? How can you have just one? 😉 I have six cats and a husband. Do you have a favorite quilting notion? Of course the rotary cutter and mats almost don’t count anymore as they are must haves. Outside of that, I love my specialty rulers from Creative Grids. This entry was posted on Friday, June 22nd, 2012 at 5:59 pm and is filed under Uncategorized. You can follow any responses to this entry through the RSS 2.0 feed. You can leave a response, or trackback from your own site. My daughter, granddaughter and myself just love your latest fabric collection of Days of Yore. My 34yr old daughter wants a king size quilt made of this fabric. 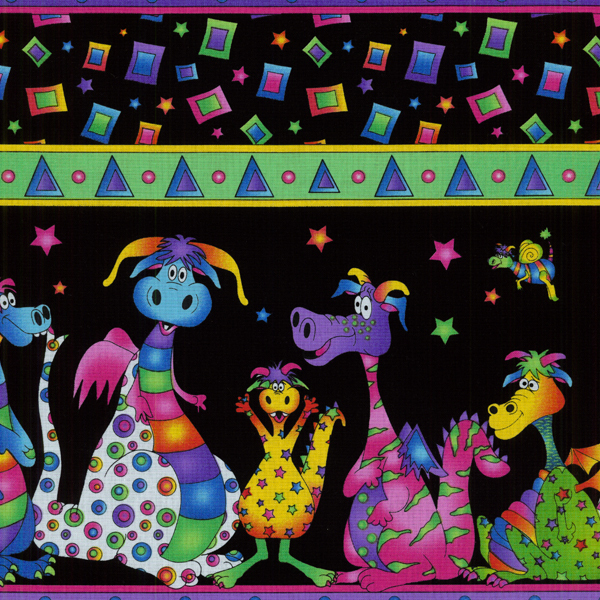 Do you by any chance have machine embroidery designs of your dragons? I am doing a nursery set for my neice with Caterwauling Tales and I have made a quilt using your Pound Hounds fabric. I just love your work.